The dental operating microscope (DOM) provides varied degree of magnification, inherent coaxial illumination (shadowless field) stereoscopic vision (depth perception) and can be mounted on a ceiling, wall, or floor stand, or may have a mobile base. DOM can have an integrated video camera to provide live video output or photography of the procedure being performed. This video output can be used for real-time display to the patient, record purposes, research, education, and communication. The DOM when used has shown to improve operator ergonomics. , Most importantly, it enables a high degree of precision in the treatment outcome. DOM can be used in pediatric patients to its fullest advantage similar to adult care. When the visual output is projected on a screen so as to be visible to the adult patient, it reduces patient movement as the patient perceives the distortion of the field with movement. There are no studies describing the effects of using the DOM in pediatric patients and its impact on the pediatric patients behavior. The study was a randomized, controlled, crossover, cross-sectional clinical trial. Ethical clearance to conduct the study was obtained before conducting the study from the Institutional Ethics committee approval. 90 pediatric patients having pit and fissure caries in both lower molars from the age group of 7-9 years with no previous dental experience were selected. Patients with deep carious lesions, in need of pulp therapy, medically, or mentally compromised were excluded. The patients were divided equally into two groups by random selection. 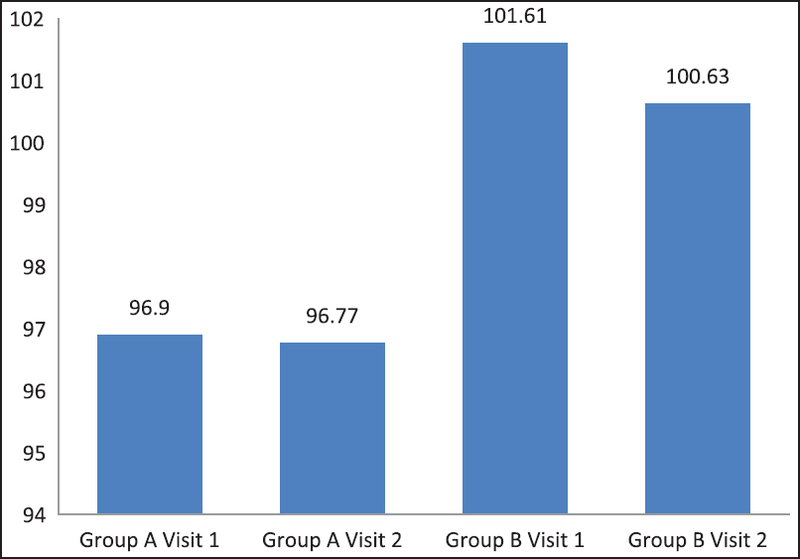 [Table 1] shows the distribution of patients according to visits. The child's overall assessment and parents written consent for participation in the study was taken in the first visit. Restorative treatment for initial carious lesions was performed. One week gap was maintained between two successive visits. When the DOM (OPMI; pico, Carl Zeiss, Germany) was used [Figure 1], the visual output monitor was kept at an angle so that the procedure was visible to the child. The same operator performed both restorative procedures to reduce inter-operator variation and bias. Routine restorative procedures were performed adhering to standard guidelines. A pulse oximeter was clipped to the thumb of the child's right hand. Pulse rate in beats per minute and percentage of oxygen saturation of the blood were monitored throughout the visit. The minimum and maximum values were recorded. At the end of the procedure patients anxiety level were assessed using Venhams picture selection test. Eight picture cards were sequentially presented to the child by a single operator. Each card comprised of two illustrations of a child, one happy and the other anxious. The anxious member of each pair occupied the left and right position on the card with equal frequency. The child was instructed to study the picture and point to the illustration that represented how they felt during the procedure. The score was calculated out of eight. Selection of an anxious illustration was scored as one and a happy illustration was scored as zero. The intra and inter group anxiety rating were compared using the Student's t-test. Data were entered in Microsoft Excel spreadsheet and analyzed using R software (version 3.2.0) for Windows. Qualitative data were presented as percentages. For all tests, the level of significance was set at P ≤ 0.05. [Table 2] shows a comparison between the Venhams rating, pulse rate and oxygen saturation between visit 1 and visit 2 for Group A. [Table 3] shows a comparison between the Venhams rating, pulse rate and oxygen saturation between visit 1 and visit 2 for Group B. 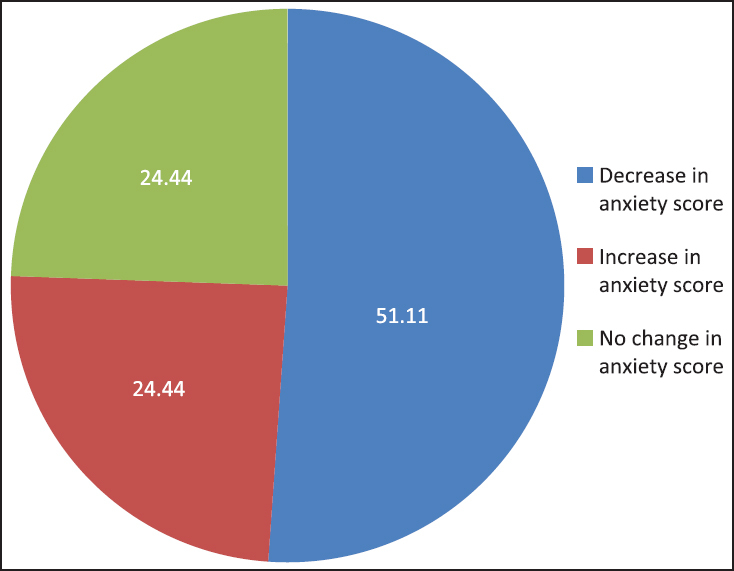 A reduction in anxiety scores was observed in the second visit in both groups [Figure 1] and [Figure 2]. This reduction was more in the group in which the DOM was used in the first visit as compared to the group in which the DOM was used in the second visit. To determine the effects of the DOM on anxiety, visit 1 anxiety scores of Group A and Group B were compared. There was no statistically significant difference between the two groups using the Student's t-test (P = 0.1). However, in the group where the DOM was used, lower scores on Venhams rating scale were observed. Pulse rate and oxygen saturation levels did not show any significant co-relation with anxiety scores. 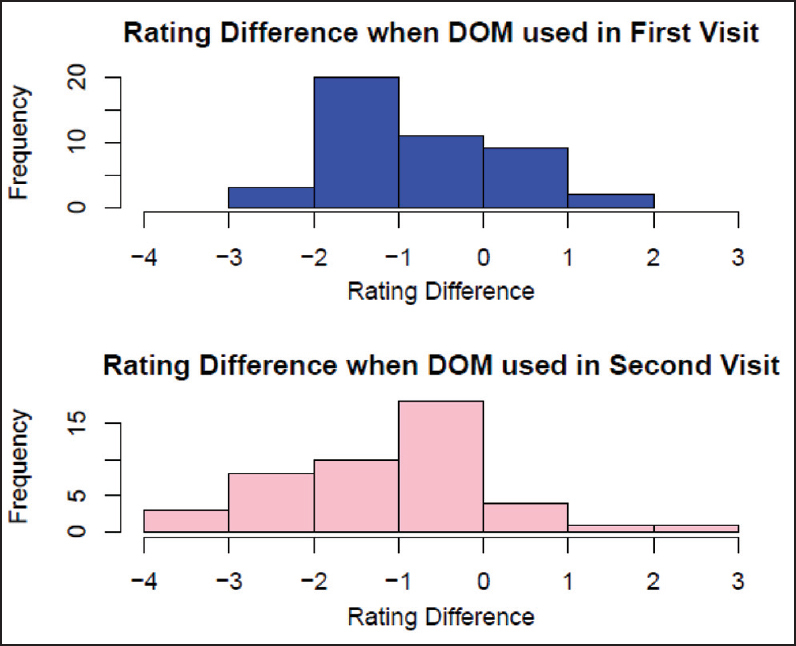 To determine if any group showed a more positive response to the DOM, the difference in Venhams anxiety ratings between the second and first visit for Group A were compared with the difference in Venhams ratings between the second and first visits for Group B [Figure 3]. Between Group A and Group B, there was no statistically significant (P = 0.2) change in the rating difference using the Student's t-test. Pulse rate did not show any correlation with Venhams anxiety scale readings in any visit [Figure 4]. Oxygen saturation readings did not show any correlation with Venhams anxiety scale readings in any visit [Figure 5]. The TSD technique of behavior management is a proven and time tested method for pediatric patients facing dentistry for the 1 st time. 7-9-year-old patients are liable to disruptive behavior in the dental office. This study used a self-reported anxiety test as well as physiological indicators to measure anxiety. The visual output of the DOM proves excellent detailing of intraoral procedures. Use of the DOM has been shown to improve intraoral caries detection. The visual output of the DOM has been effective in adults as an educational and distraction aid. Preoperative multimedia information reduces the anxiety of adult patients undergoing surgery under regional anesthesia. Similar studies on pediatric patients have not been performed. This study attempted to determine if the DOM had a similarly beneficial effect in the pediatric population. Oxygen saturation was seen to decrease with an increase in pulse rate, although the values were statistically inconclusive. Similar findings were reported by Yeldman and William  During the procedure, pulse rate was seen to increase at the commencement of caries excavation with the dental hand piece. According to Kleinknecht et al., this increase may be due to the sound and sight stimulus of the dental hand piece. During the process of caries excavation under the DOM, the pulse rate remained stable, while the patient observed the procedure. An increase in the pulse rate was noted during excavation of carious lesions at the dentino-enamel junction. 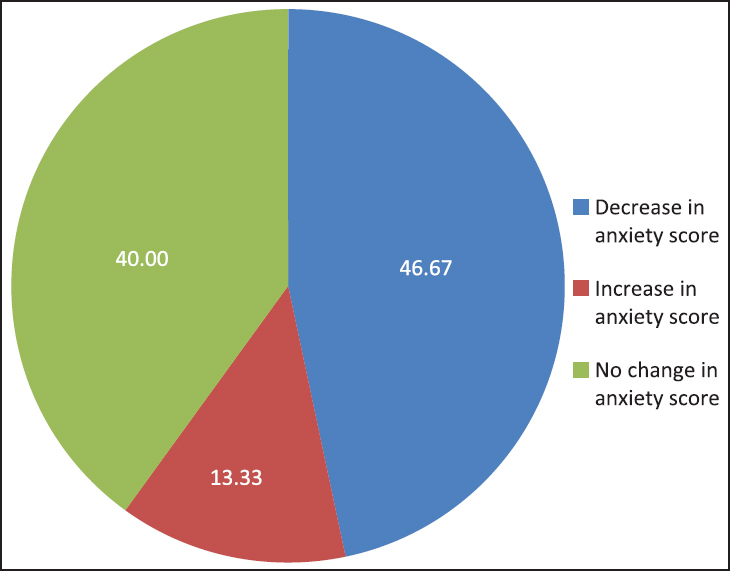 This study showed that there was a statistically significant reduction in patient anxiety between the first and second visits according to the self-reported anxiety scale. 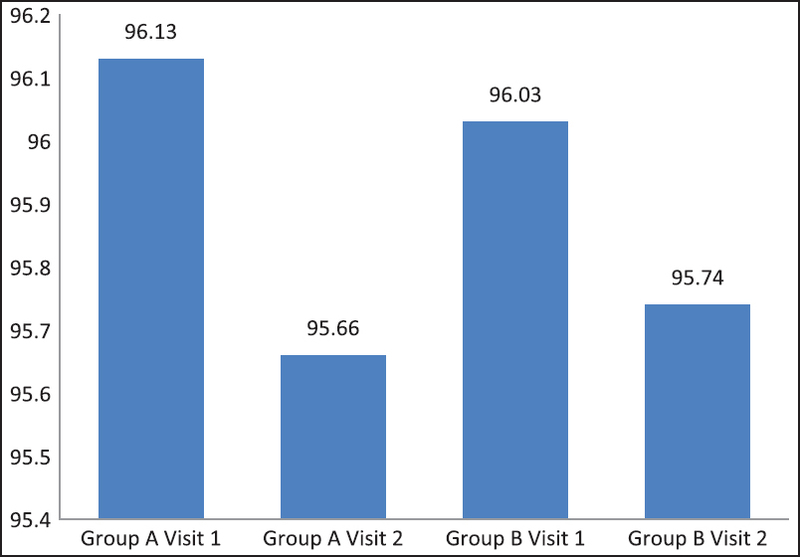 A greater percentage of patients in the group treated under the DOM in the first visit had improved anxiety scores in the second visit, as compared to the group in which the DOM was not used in the first visit. This improvement in the second visit could be attributed to greater acceptance of the treatment due to better understanding of the procedure after watching the visual output in the first visit. The traditional TSD technique has been used with variants such as audio visual aids. The use of audio visual distraction improves overall behavior in children but does not show improvement in heart rates or self-reported anxiety. Most children are aware of and have used video and camera technology. Watching the decay on the monitor may provide more credibility to the child and may reduce disruptive behavior. Patients reported to have preferred the visit in which the video output of the DOM was projected to the visit without the DOM. The operator reported significant reduction in patient movement when the DOM was used. The DOM is a valuable aid in restorative and endodontic treatment. It can be used in pediatric settings for its obvious advantages. In such a scenario the video output can serve a dual purpose, to provide unparalleled magnification and detail to the operator as well as create a visual distraction for the pediatric patient. The DOM can improve the efficiency and accuracy of restorative procedures and endodontic treatment in pediatric patients. There is a reduction in anxiety from the first visit to the second visit for restorative treatment when the DOM is used. Projecting the visual output of the DOM is effective in distracting the patient during the procedure. Patient movement is significantly reduced when the DOM is used along with its visual output. The authors wish to thank Miss. Kanchan Salvekar toward statistical analysis and data interpretation. This study received the Long Term Research Grant (AY 2014-2015) for teachers from the Maharashtra University of Health Sciences, Nashik. Addleston HK. Child patient training. Fort Rev Chicago Dental Society 1959;38:27-9. Mehrabian A, Ferris SR. Inference of attitudes from nonverbal communication in two channels. J Consult Psychol 1967;31:248-52. Prabhakar AR, Marwah N, Raju OS. A comparison between audio and audiovisual distraction techniques in managing anxious pediatric dental patients. J Indian Soc Pedod Prev Dent 2007;25:177-82. Valachi B, Valachi K. Mechanisms leading to musculoskeletal disorders in dentistry. J Am Dent Assoc 2003;134:1344-50.
van Glenn A. Magnification alternatives: Seeing is believing, part 2. Dent Today 2013;32:80-4. Venham LL, Gaulin-Kremer E. A self-report measure of situational anxiety for young children. Pediatr Dent 1979;1: 91-6. Erten H, Uçtasli MB, Akarslan ZZ, Uzun O, Baspinar E. The assessment of unaided visual examination, intraoral camera and operating microscope for the detection of occlusal caries lesions. Oper Dent 2005;30:190-4. Yeldman M, William N. Evaluation of pulse oximetry. J Anesth 1983;59:349-52. Kleinknecht RA, Klepac RK, Alexander LD. Origins and characteristics of fear of dentistry. J Am Dent Assoc 1973; 86:842-8. Guinot Jimeno F, Mercadé Bellido M, Cuadros Fernández C, Lorente Rodríguez AI, Llopis Pérez J, Boj Quesada JR. Effect of audiovisual distraction on children's behaviour, anxiety and pain in the dental setting. Eur J Paediatr Dent 2014;15:297-302.